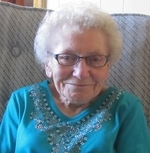 Passed peacefully away at the Connaigre Peninsula Health Care Centre in Harbour Breton on Friday, March 24th, 2018, surrounded by family and friends, Sarah Ann Blagdon, age 92 years of Boxey. Leaving to mourn her loving family: daughters, Marie Blagdon (Tom), Diane Spencer (Allan) of Boxey and Edna Strowbridge of St. Phillips; son, Barry Blagdon (Tina) of Burin; eleven grandchildren, fifteen great grandchildren and four great great grandchildren; sisters in law, Bessie (Onslow) of NS and Susie Blagdon of Boxey; cousin, Beatrice Sheppard of Boxey; plus a large circle of other relatives and friends. Predeceased by her husband, James Henry Blagdon; parents, Cecil and Keziah Blagdon; father and mother in law, William and Annie Blagdon; son in law, Garfield Strowbridge; and grand daughter, Sandra Strowbridge. Special thanks to the staff of the Connaigre Peninsula Health Care Centre; homecare workers, Susan Rose, Stephanie Hepditch and Trudy Keeping; family friend, Rosemary Keeping; and Rev. Bruce Vallis and Cora. Visitation took place at St. John The Evangelist Church, Boxey on Sunday, March 25th and Monday, March 26th. Funeral Service was held from St. John The Evangelist Church at Boxey on Tuesday, March 27th, 2018 at 11:00 am with Rev. Bruce Vallis and Rev. Mildred Tobin officiating. Interment followed at the Anglican Cemetery, Boxey. No flowers by request. Donations can be made to St. John the Evangelist Church, Boxey.